Usually, all you need to place an order is your table manufacturer name and model number. Please call us before you order at 1-800-541-0271 to see if we have your pattern. We have over 25,000 table pad patterns on file. Heat Hot coffee, casseroles, and other hot dishes can permanently mar your table. 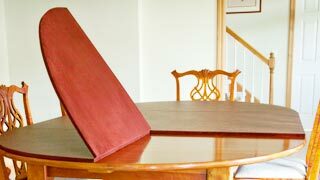 Buy a lifetime guaranteed Pioneer table pad to protect your valuable table from accidental heat damage. Scratches If left unprotected, your table can be permanently damaged by accidental scratches. 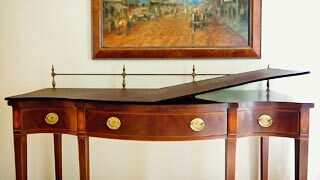 No matter how careful you are, your table comes in constant contact with items that can scratch its fine surface. Spills Moisture is fine wood furniture’s worst enemy. Water rings and spots can destroy your table’s beautiful finish. The easy-care vinyl surface of a Pioneer table pad protects against spill and stain damage. How Many Pieces Will My Table Pad Come In? How Will My Table Pad Fold? In these days of robotics and mass production, we take pride in the fact that your table pad is custom and handmade the exact same way as your grandmother’s pad. Our gals cut, snip and tuck in the same way table pads have been made for 100 years—with great care. Folding and unfolding the table pad over many years puts stress on the hinges. If the hinges are not constructed properly, they will wear out rapidly. Pioneer’s table pad hinges are handmade for strength and durability. They will withstand the test of time and stress. What other industry can promise you such quality in this impersonal age? All of our table pads come with a Lifetime Guarantee. All table pads from all companies use vinyl on top, and have for 100 years. The vinyl serves two purposes. The first purpose obviously is to keep any moisture from reaching your table, and the second is to prevent any moisture from getting into the insulation. Thus anything transferred—mashed potatoes in a bowl, turkey on a platter, coffee in a mug, soup in a bowl—are fine to set directly on your table pads; but if you are holding something with hot mitts that has directly come from the oven, you should use another trivet. Not because you will damage the table, but because you won’t want to consciously damage the vinyl top of your table pads. 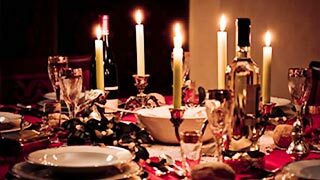 Over the past 40 years, we have heard a couple of horror stories, like fallen candles setting the linen on fire, centerpieces that have ignited and sterno accidents. In all of these different scenarios, the vinyl tops of the table pads were ruined, but the table was saved by the fact that the interior of our table pad is 100% insulation. 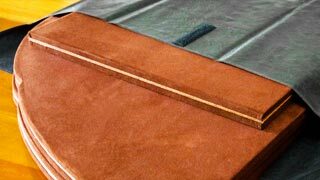 Just as Sanitas lasts longer than wallpaper, or a cloth covered book lasts longer than a paperback, vinyl with fabric backing will last much longer than with paper backing. After several years, vinyl plasticizes—that is, it begins to dry and crack because it is a petroleum product. You will see an older table pad that, although, the vinyl has begun to flake, the underlying fabric backing is still holding the table pad cover together well. 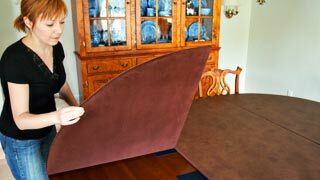 Properly constructed, the fabric backing of your Pioneer Table Pad will hold much better over a long period of time. After all, what you want from a table pad is durability and longevity. Your dining room table represents a major investment. The right table pad will make it an heirloom. For 40 years we have used velour on the bottom of our table pads. The velour, which is extremely soft and velvet-like, has stood the test of time for strength, durability and longevity. Because velour is a non-reactive material, you can leave your Table Pad on 100% of the time and not worry about your finish. All the velour components are totally environmentally friendly, non-toxic and made in the U.S.A. The inside of our table pad is 100% insulation. We do not use any solid chip, flake, fiber or core board. We’ve used this same type of material for 100 years. 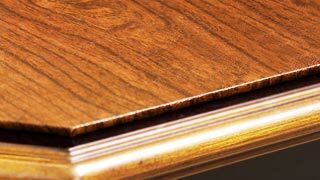 Our interior layered construction allows our pad to be flexible and have forgiveness, so when sliding the pad on or off the table it can never gouge or scratch your finish. We haven’t tried to lessen the quality of the pad by shortening the manufacturing process. The solid core boards are actually heavier, although our competitors say lighter. Also, solid core board materials are extremely rigid and offer no forgiveness if they are pushed out of shape or absorb moisture. If dropped, because of the rigidity, solid interiors tend to just crack or break. Our adhesive is the highest pharmaceutical quality, made of the same gelatin-based composition as clear vitamin capsules. This flexible grade pharmaceutical adhesive contains other harmless ingredients such as Epsom salt, sugar, glycerin and water. The glycerin in the glue allows for flexibility, which in turn aids in the forgiveness and flexibility of our product. Once the adhesive dries and is set, it will not reactivate or separate. This adhesive is stable up to 100 degrees Fahrenheit and 30 degrees below zero. Our adhesive is totally green, recyclable and non-hazardous to the environment, meeting the strictest environmental guidelines. Our objective is to maintain the versatility of your table. In order to do this, we try to make your table pads relate to their individual sections. So if you have a table with inserting leaves, we make a big piece for each half of the main table and a separate table pad for each leaf. With this configuration, you will then have table pads when your table is closed or with the addition of each leaf. But tables in the last 15 years have been getting wider and longer. We now very often have to engineer custom table pads in more sections. 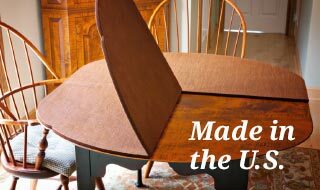 In the past, 99% of the oblong tables we made custom dining table pads for were around 40 × 60 inches, give or take 5 to 10 inches. The average round table was 40 to 54 inches in diameter; occasionally we would see a 60-inch round. Now, the normal oblong table measures 80 to 90 inches, and we see round tables measuring 70, 80 or 90 inches. Consequently, we now have to engineer these oversized tables in more sections. Again, our objective is to maintain your versatility, so if the main table is oblong and exceeds 80 inches, we have to make the main table in three or sometimes four pieces, depending on the length and shape of the body of the main table. Also, once the diameter of a round table exceeds 60 inches, your custom table pads may have to be engineered in three to eight pad sections. The number of pad pieces will be determined by the size of the round. The Reason: Table pad companies are restricted by the sizes of their inner insulation material, vinyls, backings and the roller coating machines. Consequently, we are only capable of making these table pad sections so big. Also, if the sections are too large, they become unmanageable and the product doesn’t last as long as it should. Today, 90% of table pads are made to fold once like a book. Remember, our objective is to maintain the versatility of your table, so we make custom table pads for each half of the main table and a separate table pad for each leaf. Each one of these pieces will fold once like a book. All table pads from all companies fold for storage and shipping. The only exception would be table pads made for a small piece like a placemat. This would be made solid, unless requested otherwise. However, because we are restricted by our raw materials, sometimes we have to make the table pads for longer tables to fold in thirds, and table pads for exceedingly wide tables have to fold in quarters. 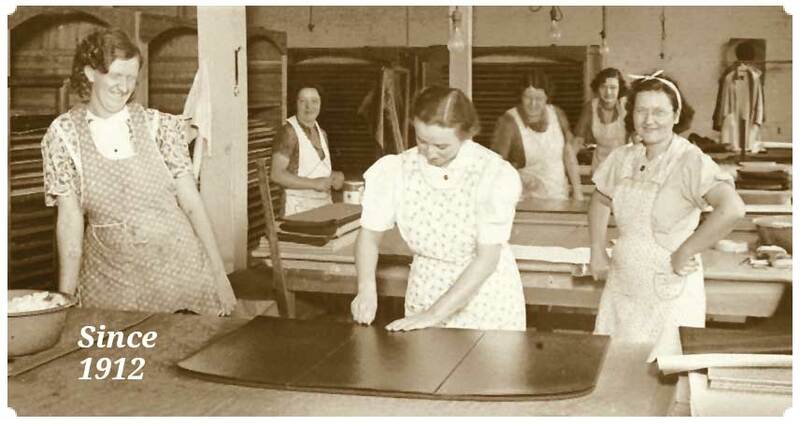 100 years ago, everything that left our table pad factory folded in quarters. We made table pads this way for about 30 years. Then the engineering of table pad covers changed. Most table pads were then made to fold in thirds, except those for very wide tables, which still folded in quarters. We did this for the next 30 years. Now the majority of custom table pads that leave table pad factories fold once like a book, except, again, table pads for very wide or long tables may have to fold in thirds or quarters.